January 21, 2018 By This post may contain affiliate links. Your kids will think these Valentine’s day treats are oh-fish-ally the sweetest! 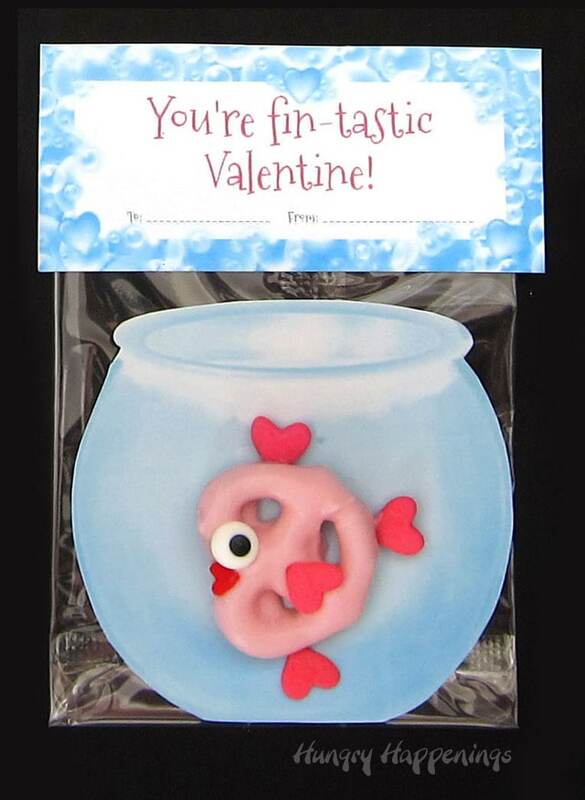 Each pink candy coated Valentine’s Day Pretzel Fish looks like it’s swimming in a fish bowl and is packaged in a bag topped with a punny Valentine bag topper. Thanks for coming back to check out the second pretzel animal in my Valentine’s Day series. When I was trying to decide which pretzel to show you first it was hard to choose which one I liked the best. The Pretzel Unicorns were so cute but so are these Pretzel Fish. Don’t you think? 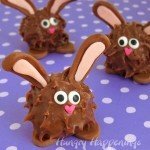 Whenever I finish making my treats I get so excited about sharing them with you, and being a rather impatient person I always want to rush to get them published. To date I have created 4 Valentine’s Day pretzel designs that I’ll be sharing over the next week or so, but have to get all the videos edited and posts written. I hope you come back to check them all out. These pretzel fish made me so happy. Each candy coated pink heart shaped mini pretzel twist is decorated with bright pink heart sprinkle fins and tails and bright red heart lips. 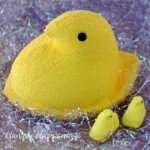 They are pretty easy to make and look so cute packaged along with a printable fish bowl and a punny bag topper. 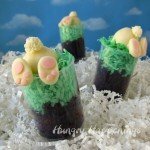 I chose to dip my pretzels in Pink Candy Melts to make these pretzel fish, but you can certainly dip them in melted and tempered pure white chocolate. 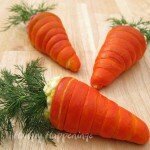 If you want your fish to be pink then you’ll need to use an oil based chocolate coloring. 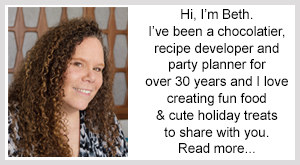 You can read all about working with and coloring chocolate and confectionery coating (Candy Melts) on my Chocolate Making Tips page. Once you get your pretzel fish decorated you can package them in clear cellophane bags and add a printable fish bowl and bag topper. 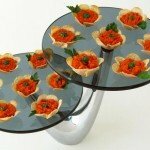 I really think the printables make this Valentine’s Day treat extra special. 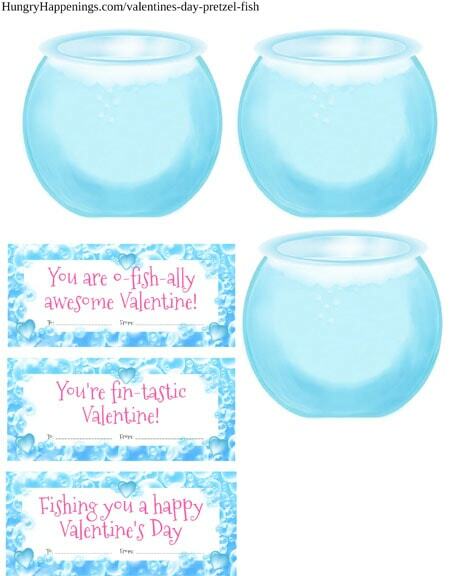 Click on the image below to print out the Fish Bowl and Valentine’s Day Pretzel Fish Bag Toppers then print them out and cut out around the shapes to add to clear cellophane bags. Watch the video below to see how to dip and decorate these Valentine’s Day Pretzel Fish. 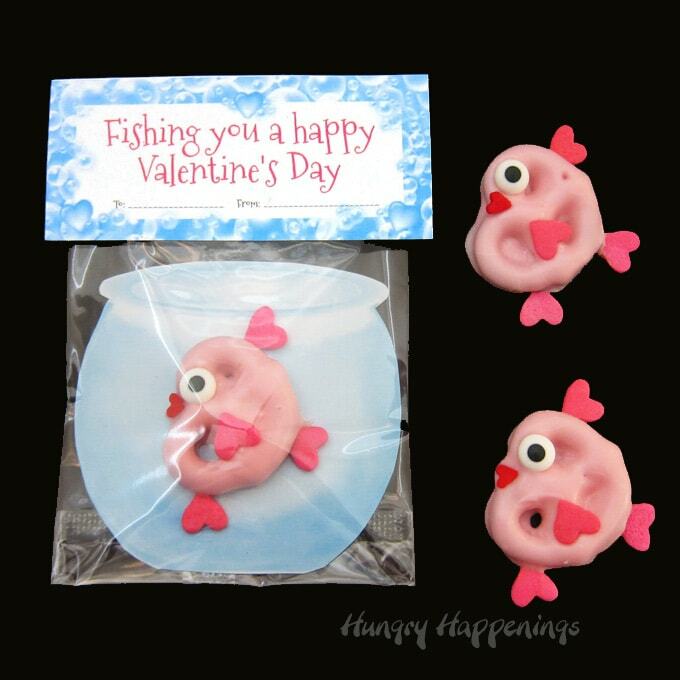 Mini pretzel twists dipped in pink candy melts are decorated with candy eyes and heart sprinkles to look like cute fish. 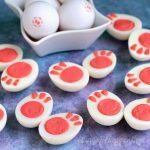 Dip one mini pretzel twist in pink candy melts using a dipping tool or fork. Remove and allow excess candy to drip off. Set on a parchment paper lined baking sheets. 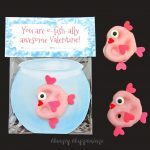 Attach 4 jumbo pink heart sprinkles to create a tail and 3 fins. Attach 1 candy eye and 1 mini red heart sprinkle creating lips. Chill in the refrigerator for 3-4 minutes until hardened. Repeat dipping and decorating a total of 36 pretzels. The heart sprinkle tails and fins need to be pressed into the candy melts so that they are securely attached otherwise they may break off. You can, if you want, allow the candy to harden the turn the pretzel over and add a bit more candy coating to the seam between the heart sprinkle and the pretzel. If you keep the pretzels in the freezer for too long they may crack. Remove them after they have hardened. Use 3×4 inch clear cellophane bags to package your fish. Cut out and attach the bag topper using double stick tape. 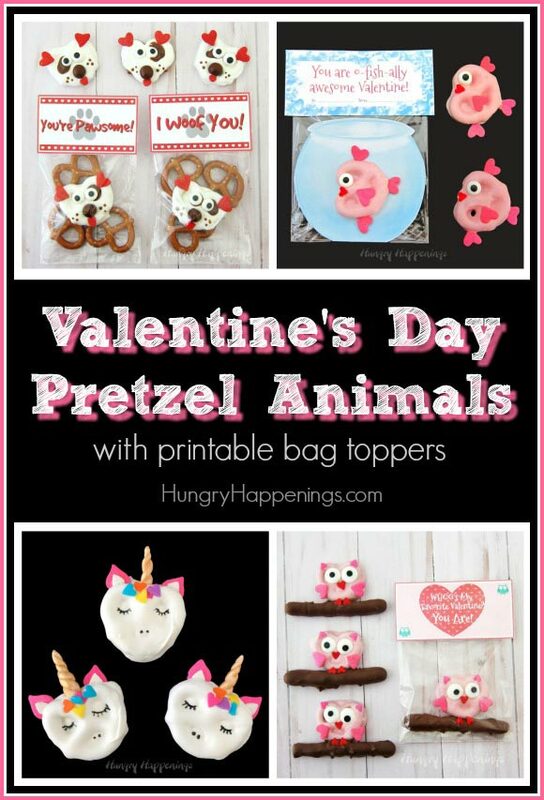 If you make these Pretzel Fish Kid’s Valentine’s Day Treats and share them online be sure to mention HungryHappenings, link back to this blog post, and use #hungryhappenings.